(KIA-POW) On 15 August 1944 - Mission #229 to Wiesbaden, Germany in B-17G #42-102432 Tiny Angel (427BS) GN-U. Formation subjected to heavy attacks by FW-190s and ME-109s - the "Abbeyville Kids". Nine 303rd BG(H) B-17s were shot down. Tiny Angel exploded and crashed near Malberg, Germany. Most of the crew parachuted. Sgt Smalley's leg was shot off. He became a POW and after being treated by German doctors was repatriated back to U.S. hands. 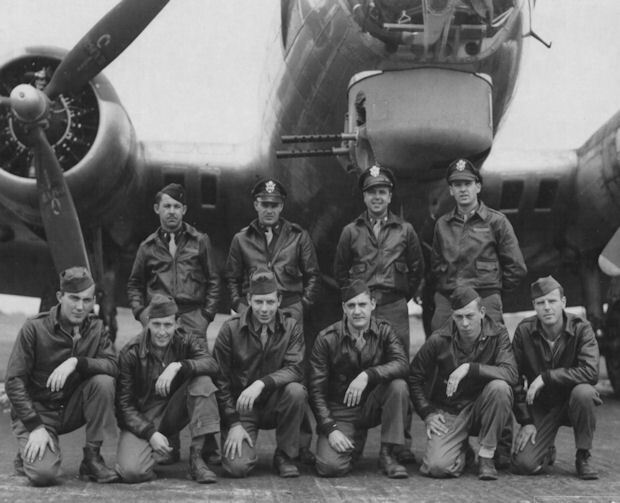 Crewmen, except for Mason (CP - 15 missions) and Joyce (WG - 28 missions) were on their 17th mission. Substitute Waist Gunner was S/Sgt Jess Joyce (KIA), from the Lt John W. Gallagher, Jr. Crew. Duggan (WG) - Flew 14 missions with the Cook crew. Removed from combat after the 9 Aug 44 mission. Fisher (WG) - Flew 2 mission with the Cook crew. Removed from combat after the 18 July 44 mission. Crew size reduced to nine men.